An aerial view of the foot like piece of land extending into Lake Superior near Thunder Bay, Ontario where beautiful waterfront properties are located. The land around the coastal shores of Lake Superior near Thunder Bay, Ontario stretches out into the lake where residential properties sit along the waterfront. Each of these properties have a beautiful view, their own beach and boat ramps which allows people to fully enjoy the Ontario summers without leaving their own yards. The land formation looks like that of a calf and foot with a road which runs along one side of the properties. The only strange piece is the small hook which extends off the back of the foot, but this gives one of the quiet properties their own little cove. 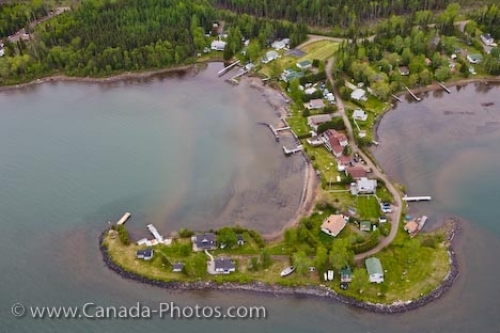 Waterfront properties along the shores of Lake Superior near Thunder Bay, Ontario, Canada. Aerial picture of a piece of land which extends into Lake Superior near Thunder Bay, Ontario where waterfront properties sit.